The English Major: What is it Good For? Many articles have cropped up lately, some of which were highlighted here, that praise the English major, promising lucrative career opportunities after graduation. Most of these articles focus on an English major’s ability to write and the careers best suited to this ability (marketing, public relations, etc). Two recent articles, however, focus not just on writing prowess, but on an English major’s ability to deal with complex material, citing this as vital to future success. In his article “The Value of a Liberal Arts Education in Today’s Job Market” Dr. George B. Forsythe states that, while perhaps broader than other college disciplines, “a liberal arts education produces lifelong learners,” thus allowing “students to excel in critical thinking.” Forsythe goes on to list the abilities required for workplace success: critical thinking, effective communication, integration of knowledge, and global awareness, all of which are gained through a typical liberal arts education. 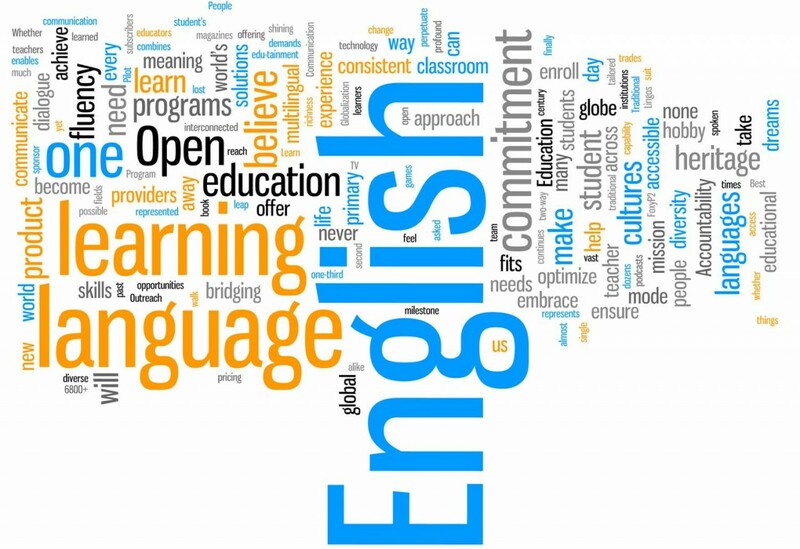 What both authors strive to communicate is this: Less important than what English majors learn are the kinds of learning the study of English cultivates. By dealing with complex and difficult material throughout college, English majors hone their abilities to comprehend and communicate future complex concepts. These skills apply to various other disciplines, many of which provide numerous fruitful career paths. 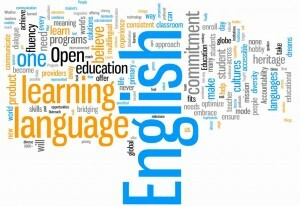 Yet another way majoring in English can help you achieve big career goals. We bloggers are heading into hibernation for the holidays, so please stay tuned for more posts after the New Year! We hope that you all enjoy your time with friends and family and take a well deserved break from the stresses of school and work. 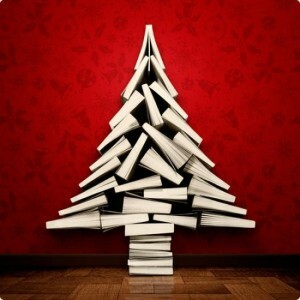 Although we’ll be resting up just as much as you, we encourage you to keep on reading! HERE is a The New York Times’ list of “100 notable books of 2012.” If you plan on taking this break to set your Chaucer, Shakespeare, and Melville aside, and instead pick up some more current literature, this is a great place to start! During your break please let us know what you’re reading, what you’ve finished, and how you liked it in the comments section below! Also, feel free to leave us any comments regarding what you would like to see more of, interesting literary discoveries, and any other tidbits of information you feel inclined to share. Have a lovely break and a happy New Year! In the past few months our blog has been host to many posts about book to film adaptations. You read about The Perks of Being a Wallflower’s safe and easy transition onto the big screen, as well as Cloud Atlas’ more risky adaptation. 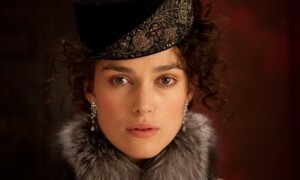 Today we bring you yet another adaptation story, again along the risky line, with Joe Wright’s new film Anna Karenina. Joe Wright, known particularly for his work with Keira Knightley in such projects as Atonement, and Pride and Prejudice, has made himself famous adapting classic books to film. What makes Wright so special, however, is his ability to do so seamlessly, cutting the film down to time constraint, but maintaining the ambiance and feel of the original novel. Perhaps it is the way that he directs his actors, his attention to historical detail, or his decisions of cinematography that maintain these “bookish” qualities in his films—but some would argue that it is something else entirely. Critics like Paul French would argue that it is Wright’s innovation which he brings to classic stories that is at the heart of his success in book to film adaptations. Did you miss Wordstock this year? 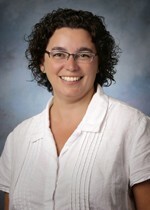 Here’s a piece written by UP English Professor and Wordstock volunteer Dr. Brassard to tell you what you missed and why you should attend next fall. Wordstock is one of my favorite things about living in Portland. Like Powell’s, it showcases our city’s love of the written word, and I visit the festival every year to hear some favorite authors read from their work and respond to audience questions, as well as discover new writers by pure chance. In recent years, I have been thrilled to hear writers like Jennifer Egan, Mona Simpson, Ethan Canin, and Anne Enright discuss their new books, work habits, and favorite authors (because as we all know, the best writers are first of all voracious and discriminating readers). One writer I knew nothing about before attending Wordstock in 2009 was David Rakoff, a wonderfully dark, funny, smart, and perceptive author of essays (including his ‘classic’ Half-Empty, for those among us who are not ‘happy all the time’ people), who recently died of cancer at age 47. A perennial local favorite at the festival is Chelsea Cain, a witty and self-deprecating author of thrillers set in Portland, starring a vicious serial killer named Gretchen Lowell who looks like Storm Large, and the obsessed detective who pursues her (her books have been bought by FX, who will produced a television series adaptation). Sadly, I have also heard authors at Wordstock who completely turn me off and left me determined to never pick up their work (usually because they were pompous, self-important, egotistical, and sometimes downright rude). You’ve heard of ‘don’t judge a book by its cover’? In this case, I fully admit to judging books by their authors’ personality. This post is based off of the article Beyond the Matrix by Aleksandar Hemon and published in The New Yorker. How does one go about adapting a book to a screenplay when its own author deemed it “unfilmable” due to its complications? Lana and Andy Wachowski (known for writing and directing the “Matrix” trilogy) have the answers. The siblings, along with co-director and friend Tom Tykwar, took author David Mitchell’s 2004 best-selling novel Cloud Atlas and adapted it for the big screen. 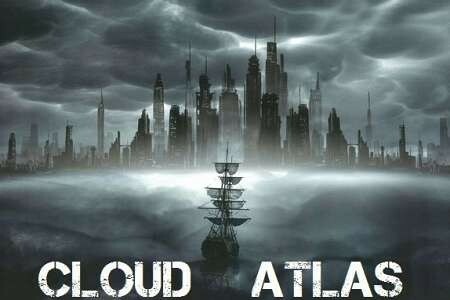 This was no easy task to take on, for Cloud Atlas follows six separate plot lines spanning centuries, includes a post-apocalyptic version of English which has mutated into a whole new language, and contains very specific leitmotifs. All of these aspects make translating the text from word to image very difficult, for not many 2 hour films take on such a hefty load. A FREE Night At the Movies! Another novel to film adaptation… for free! 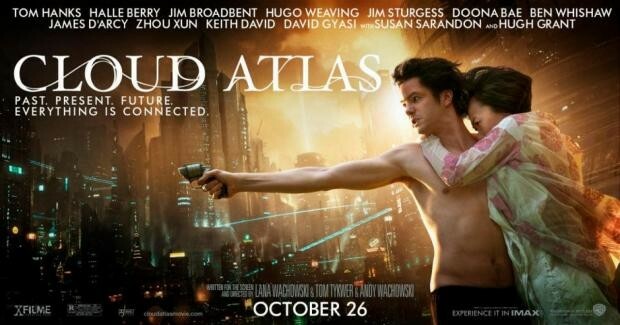 Cloud Atlas is officially being released Friday, October 26th, however a free screening will be hosted at the Regal Bridgeport Theatre on Monday, October 22nd at 7 pm. For more information about the screening contact Dr. Brassard (brassard@up.edu), and for more information about the film in general see below. From acclaimed filmmakers Lana Wachowski, Tom Tykwer, and Andy Wachowski comes the powerful and inspiring epic “Cloud Atlas,” based on the best-selling novel by David Mitchell. Drama, mystery, action and enduring love thread through a single story that unfolds in multiple timelines over the span of 500 years. Characters meet and reunite from one life to the next. Born and reborn. As the consequences of their actions and choices impact one another through the past, the present and the distant future, one soul is shaped from a killer into a hero, and a single act of kindness ripples across centuries to inspire a revolution. Everything is connected. A note from Kari Hill. Macklemore’s music is the poetry of our time. In an age where for most rappers the words ‘poetry’ and ‘rap’ could not be more distant, his voice speaks truth, or at least makes a statement. Each song on his new album, ‘The Heist,’ takes on a different social issue (although there are some fun ones in there too).footage for you here. He writes about gay marriage, consumerism, greed, corruption, apathy, technology overload, the government and the anomaly that is his career. He is one of the few truly independent artists (aka not signed to a record label) to reach the coveted ‘#1 on iTunes’ spot. Adapting a novel to a film is tricky—I know this because I am one of the suckers who always go to see the movie adaptations of their favorite books. Apart from To Kill A Mockingbird I must say that I am generally disappointed with the results. The two-hour length of most films never seems to be enough time to develop all of the nuances and underlying themes that a novel includes. While some movies often stand on their own as great art, comparing them to the books they are based on seems, at times, pointless. 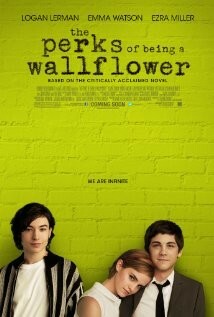 However, this is not the case with the newly released film The Perks of Being A Wallflower. I read Stephen Chbosky’s The Perks of Being a Wallflower last year while traveling in Belgium, and I was enthralled with the characters, the story, and the mystery of what “getting bad again” meant during most of my time there. The book offered up its own journey and explored the human condition of empathy and how detrimental, but simultaneously beautiful it can be. It was one of those books that makes you regret reaching its end because you are not ready to give up the character whom you have grown so close to. I knew immediately that I liked Anna Keesey and her spunky personality when she stated that her newly published book had gone from a stack of papers to something that you can “punish a cat with.” She meant of course that the book now exists as a real entity, a production of cardboard and paper, but her particular phrasing illuminated her fantastic sense of humor. During her lecture Anna Keesey introduced and read from her newest work Little Century, a tale about 18-year-old Esther Chambers and her experience with the conflict between the Central Oregon shepherds and cattle rangers in 1900. 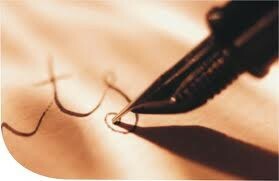 Keesey’s writing was entrancing, for attention to detail and imagery thickened the words with meaning. The rhythm of the sentences at times seemed to match the slow, rambling that is rural life, while at other times hurtled forward with the speed of the stampeding sheep. I was both lulled by the calming, languid narrative, but also shaken awake when it would suddenly transform with an urgent energy. All of this was palpable in the two brief sections that Keesey read aloud. When asked about her writing Keesey revealed many things about her methods and choices. She considers this book to be Historical Fiction (which she defines as a constructed reality predating the author’s life) and was prompted to write it in response to a real incident between Oregon shepherds and ranchers. Keesey outlined the intense amount of research that went into writing this historically based book, explaining that the absence of some historical evidence forced her to imagine and construct her own realities. Keesey also admitted to extreme shifts that occur in her writing from draft to draft, explaining that while the final book is written in the third person present tense point of view, it was originally written in first person past tense. As for writing advice, Keesey explained that a text can only “vibrate” with energy when everything in it is meaningful and thus does not waste readers’ attention or investment. As Keesey said, readers have to carry a “cargo of meaning” when they read a text, and giving them too many inconsequential details overwhelms their ability to understand. Overall Keesey’s reading and lecture was informative, pleasant, and left the audience wanting to know more about Little Century.